SrMise is the DiffPy tool for peak extraction and peak fitting from atomic pair distribution functions (PDFs). It implements a powerful information-theoretic multimodeling approach based on the Akaike information criterion (AIC) to generate and rank physically plausible sets of peaks even in the absence of a constraining structural model. This approach to peak extraction is premised upon PDFs reporting accurate experimentally-determined uncertainties, and when these are unavailable results are contingent on a user-specified ad hoc uncertainty. PDFs mixing positive and negative peaks, such as some neutron PDFs, are compatible with the SrMise peak fitting, but not peak extraction, capability. The software aids rapid analysis of crystalline and nanostructured materials. Reasonable values for nearly all program parameters can be estimated directly from the data, although the PDF baseline of non-crystalline materials requires user judgment. 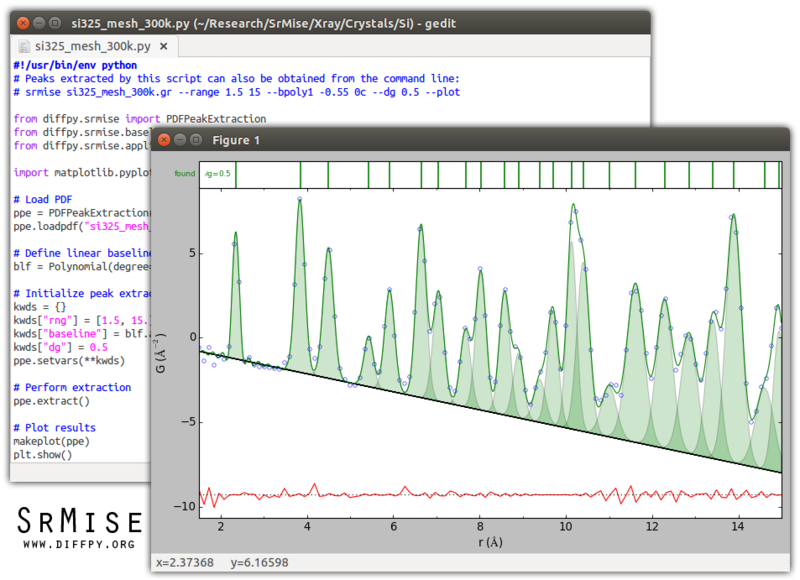 Crystalline (linear) and spherical nanoparticle baselines are included, and SrMise also supports arbitrary polynomial and interpolated baselines. Other key features include peak functions incorporating termination effects, standard uncertainty reporting, and a framework enabling a flexible AIC-driven multimodeling analysis. A command-line tool exposes basic peak extraction functionality, with full functionality available through Python scripting. This is an alpha release of SrMise, and the capabilities and documentation of the project will evolve. In particular, the multimodeling API is expected to change significantly in a future version. The DiffPy team encourages investigators to use the software even at this early stage, and invites feedback and suggestions. The simplest way to obtain diffpy.srmise on Linux systems is using pip to download and install the latest release from PyPI.